Electric-only cars might be envogue right now, but Toyota is pursuing another eco-friendly alternative to gasoline engines with its FCV concept. The company is now claiming the vehicle will be available sometime in 2015—at least if you live in California where (hopefully) hydrogen refill stations will be plentiful by then. 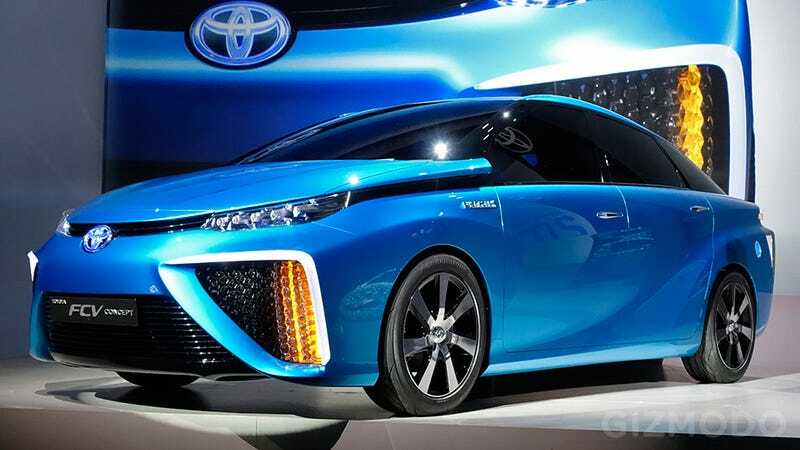 The FCV borrows the same Hybrid Synergy Drive used in the Toyota Prius, but swaps out the gas engine for a hydrogen fuel cell. And while hydrogen refill stations are few and far between right now, Toyota is hoping that tiny downside will be outweighed by the benefits of a fuel cell vehicle: including its estimated 300 mile range on a single fill-up, and water vapor being the most harmful thing the FCV emits. And anyone who deals with constant power outages might be intrigued that on a full tank of hydrogen gas the FCV can power a house for a full week. Does Toyota&apos;s Hydrogen Car Prove They&apos;re Eco-Clueless?